The enchanting city Prague is full of beautiful buildings and historical sites. Built on nine hills alongside the Vltava River, Prague is a city of architectural wonder. Known as the city of a hundred spires and green gardens and parks, Prague is the perfect destination for those looking to travel to a European city rich with history and architectural wonders as the city offers everything from romantic getaways to historical tours. You’ll find that it is impossible not to feel the charm of the capital and largest city of the Czech Republic. With Prague’s current appearance it is easy to forget that the Czech Republic emerged from the fall of the Iron Curtain, just over twenty years go. Millions of travellers check the pulse of this most compelling transformation of the New Europe. It is a perfect setting for the Prague Intercup, an international B-show, hosted by ACHPAK CR and run by Jaroslav Lacina (current ECAHO President). A team of four acclaimed judges ranked the participants: Anna Stojanowsky, Claudia Darius, Gianmarco Aragno, and Peter Gamlin. The quality of the horses was high and the competition tough; no wonder, some participants had a rapid pulse. The Prague Intercup Gold Champion Yearling Filly and European Cup Gold Champion Junior Filly was the Progrom daughter Wadelia out of Wrozka by Ganges and the wonderful Wiperia, bred and owned by Lutetia Arabians, France. Wadelia received 92,50 points and therefore the highest mark of all fillies. The Prague Intercup Silver Champion Yearling Filly was bred by Dubai Arabian Horse Stud, UAE: D Feddah, by Shaghai EA out of D Jowan. Bronze went to the SMA Magic One Daughter Fajir Albidayer, bred and owned by Albidayer Stud, UAE. 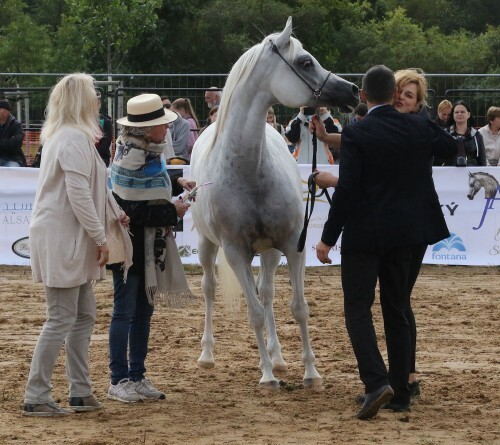 The grey Kahil Al Shaqab daughter Safiat Al Shaqab out of Shalimar Prestige, by Kubinec son Nablus and in tail female line back to Spanish bred Hezina, bred and owned by Al Shaqab Stud, Qatar, took the Prague Intercup Gold Champion Junior Filly. Another beauty from Dubai Arabian Horse Stud garnered silver, D Yara, by FA El Rasheem, while Albidayer Stud’s lovely Kanz Albidayer daughter Mayadah Albidayer achieved bronze. The judges chose Eleganzaah, by EKS Alihandro out of Divina by Sajida, for European Cup Silver Champion Junior Filly. This bay beauty is bred by Claudio Mazza and owned by Emanuela Scaramella, Italy. La Movida Arabians’ WH Justice daughter, Basilea El Justice out of Bali El Marwan, received European Cup Bronze Champion Junior Filly. It was a close call with Muntasir J, a chestnut son of Excalibur EA out of Mississippi J by QR Marc, bred and owned by Jadem Arabians, Belgium, who won the Prague Intercup Gold Champion Junior Colt. Muntasir J was the winner of the yearling colts with 92,17 points, the highest mark of all colts. Silver achieved the WH Justice son Jaal Aljassimya out of Annaiss, bred and owned by Aljassimya Farm, Qatar. Cyclone OS, an RFI Farid son bred and owned by Osterhof Stud, Germany, garnered bronze. Muntasir J triumphed in the European Cup, winning gold, with Cyclone OS winning silver. A great success for his breeder Karl-Heinz Stöckle, who celebrates the 30th anniversary of Osterhof Stud this September. Michaela Weidner’s grey colt Muranas Adl, by Muranas Jassehr out of Muranas Azeezah, garnered European Cup Bronze Champion Junior Colt. Halsdon Arabians’ Altamira attained double success in the Senior Mares Championship and achieved Prague Intercup and unanimous European Cup Gold Champion Senior Mare. Before she was sold to UK, Altamira was Janow Podlaski’s well-respected broodmare by the impeccable sire Ekstern. Many Arabian horse lovers will remember the moment, when the incredible Altamira rocked the show grounds upon her debut at Bialka as a yearling, besting such names as Ejrene. Pistoria, Norma or Sefora. The Moneo FM daughter LC Farfala, bred by Haras de Cataline and owned by Shgair Stud, accumulated Prague Intercup Silver Champion Senior Mare, close behind Altamira – it was again a tie. Bronze was Berenika, by Eden C, bred by Janow Podlaski and owned by Nina Suskevicova, CR. Bay Berenika made her owner proud by winning European Cup Silver Champion Senior Mare while Bohema, by Ekstern, garnered European Cup Bronze Champion Senior Mare, bred by Janow Podlaski and owned by P.P.H. Parys SP, Poland. Lawrence El Gazal was able to celebrate a double success, achieving Prague Intercup and European Cup Gold Champion Senior Stallion, both decision were unanimous. The grey nine years old stallion is a son of World Champion Gazal Al Shaqab and Lara El Ludjin, a daughter of the famed Ludjin El Jamaal, bred and owned by La Movida Arabians, Austria. Prague Intercup Silver Champion Senior Stallion Albahhar JFD was bred by Abu Dahash Talaat and is proudly owned by Alessia Saceioni, Italy. Albahhar JFD is by Solaz J out of C Marcs April Rose. Alfabia Aragon, by ZT Magnanimus, accumulated Prague Intercup Bronze Champion Senior Stallion; he is bred by Zichy Thyssen Arabians and owned by Halsdon Arabians, UK. 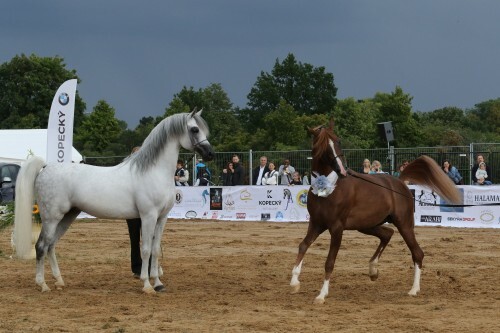 The European Cup Silver Champion Senior Stallion was awarded to Summum Marc K.A., by QR Marc out of L Serenella, bred and owned by Knocke Arabians, Belgium. The farm celebrated a further great success with several QR Marc descendants at the Belgian Nationals the very same weekend. 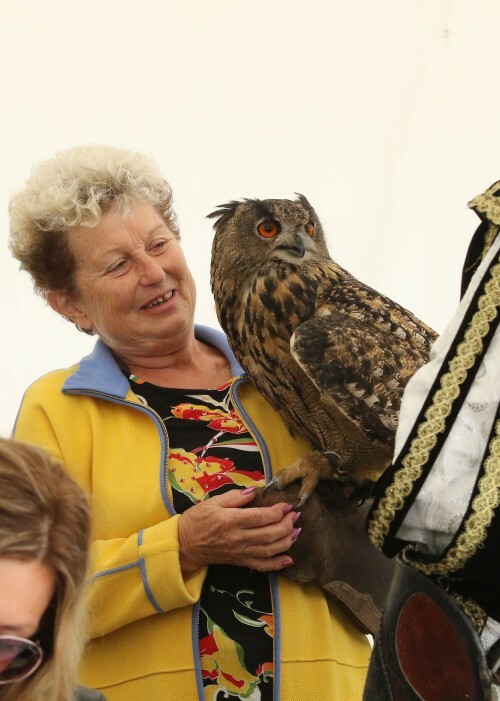 (Find out about the Belgian Nationals here.) Halson Arabians again received bronze, this time of the HS Etiquette son Preferans, bred by Janow Podlaski. Following the championships, additional specialty awards were presented. The trophies for Highest Score of the Show, Best Mover and Best Mare of the Show were awarded to Altamira. The Awards for Best Czech Owned Horse was presented to Berenika, owned by Nina Suskevicova, who received the very same trophy in 2016 for the lovely Ekstern daughter Ebora. Best Czech Bred Horse was KA Barbela Arminius, by Emerald J out of Bali, bred by Pavel Kanka and owned by Vaclav Sverkos. And finally, the trophy for Best Stallion of the Show was presented to Lawrence El Gazal. Congratulations to the breeders and owners of these exquisite Arabian horses. 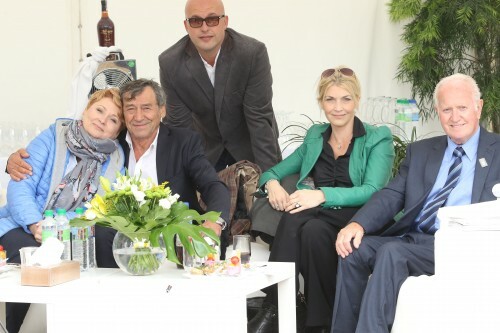 Thank you to Jaroslav Lacina and his team, who helped to make this a memorable event. The pulse of the place was fast!